ALISYN CAMEROTA: Tell us everything that transpired this morning. DAVID SHORTELL (pictured): Alisyn, an extraordinary morning. We were here since 5:00 a.m. waiting for whatever was going to happen. It was dark. 6:00 a.m., just after the hour, about a half dozen police vehicles with sirens, but no sounds, pull in front of this Fort Lauderdale home, where Roger Stone was presumably asleep. The lights were off in the house. About a dozen officers, FBI agents wearing tactical vests and with large weapons fanned out across his front lawn. One went up to the house and rapped on the door, shined a flashlight inside, said “FBI, open the door.” Moments later, as you heard in the video, it say “FBI warrant,” that’s what the agent said. We then saw a light go on the second floor and moments later, there was Roger Stone in the doorway. CAMEROTA: What’s so fascinating is that we’ve talked to his attorney, the attorney didn’t know it was coming. 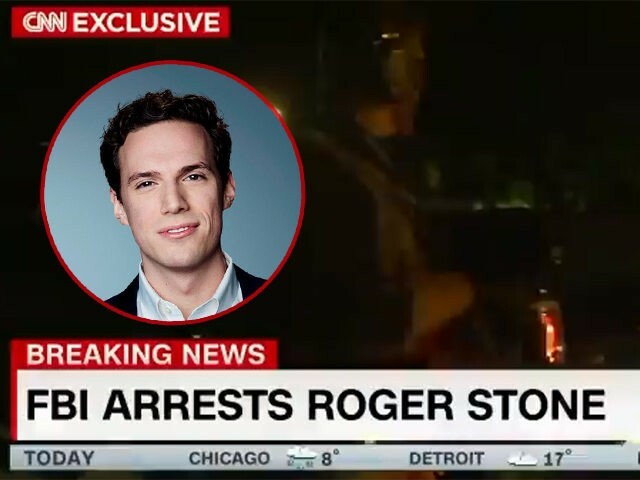 Clearly, Roger Stone didn’t know this was coming. You were staked out at his house, you didn’t know that this was coming. Why were you there in position? SHORTELL: Alisyn, it’s a reporter’s instinct. The whole Russia team thought maybe something was happening. There was unusual grand jury activity in Washington, D.C. yesterday. The grand jury, Robert Mueller’s grand jury, typically meets on Friday — yesterday, a Thursday, there was grand jury activity. We also had some other signs that maybe something was going on this angle, the Roger Stone angle. So we showed up at his house this morning, we were the only ones there, and, lo and behold, the FBI agents did come and arrest him.